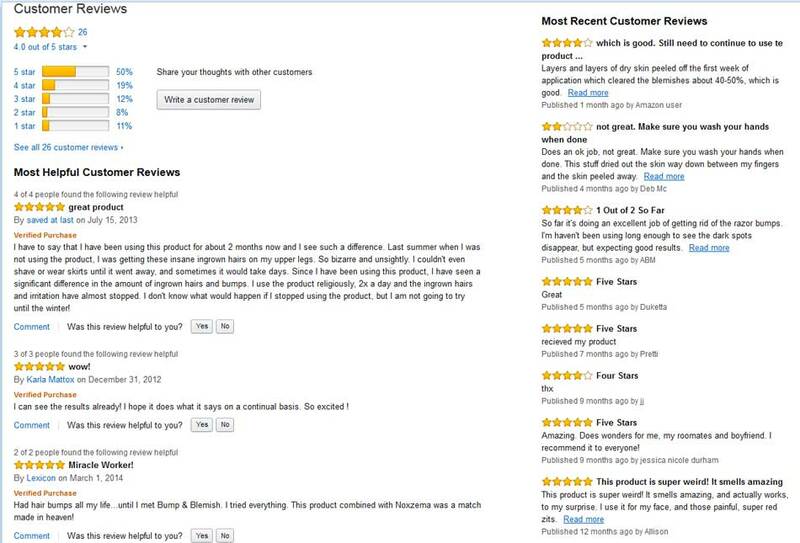 Bump Fighter and Dark Spot Corrector: say goodbye to bikini bumps for good! BUMP & BLEMISH® solves razor bumps AND hyperpigmented dark spots. BIKINI BUMPS and DARK SPOTS: solved ! BUMP & BLEMISH® is the most effective solution for razor bumps, bikini bumps, razor burn, ingrown hairs AND the unsightly dark spots (hyperpigmentation) they cause. More active ingredients, great skin penetration and subtle natural fragrance - it is the next generation razor bump fighter plus dark spot corrector (2 products in one!). Tired of getting bumps after you shave or wax? You need to know how this happens! A bump is born when a hair is trapped inside the skin, or grows back into the skin. Your body interprets it as foreign body. and reacts with redness, swelling and pain (like when you get a splinter). This results in the appearance of "bumps" in the skin. These problems are common after shaving, hence the name "razor" bumps, but they are also common after tweezing, using epilators and waxing. Less frequently, after electrolysis and laser hair removal. They are specially common when the hair is thick, curly and in an area in close contact with clothes. The bikini area is specially prone to razor bumps, and here you have them: the unsightly bikini bumps! Bumps that do not get resolved over time can develop into hyperpigmented areas, dark spots, to compound the problem. BUMP & BLEMISH® helps you prevent and solve all of these issues. Apply BUMP & BLEMISH® immediately after any hair removal procedure, and daily afterwards, to maintain the appearance of smooth, clear skin. 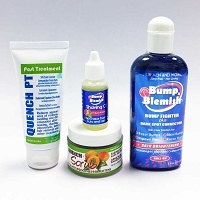 BUMP & BLEMISH® is widely used by dermatologists. 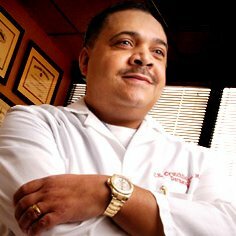 This is an excerpt from an interview published in June, 2011 by Dermatology Times, with Dr Charles E. Crutchfield III*. Dr Crutchfield is a prominent dermatologist practicing in Eagan, Minnesota, head of Crutchfield Dermatology and Associate Professor of Dermatology of Minnesota Medical School. NOTE: Dr Crutchfield has no ties with or financial interest in ESBA Labs or BUMP & BLEMISH®. "A lotion by ESBA Labs, called Bump and Blemish Fighter, may be one of the best options among the less-expensive products." Dr Crutchfield, who has no financial ties with the company, says he tried it and has used it on several patients in the past few months with good results. "It contains an anti-inflammatory, exfoliant and ingredients that fade away the dark spots. That is another problem with patients of color- they often heal with dark spots that are as bothersome as the razor bumps. This product helps rid of that post-inflammatory hyperpigmentation"
Persistent razor bumps or ingrown hairs lead to over-stimulation of the melanocytes (dark pigment producing cells in the skin) resulting in dark spots. BUMP & BLEMISH® is the only product in the market that helps with the bumps AND brightens the skin, evening out the skin tone. Three patented, naturally derived active ingredients: Chromabright®, a new lipo-soluble skin brightener that readily penetrates the skin and that is used in the most expensive skin care products; SabiWhite®, a natural ingredient derived from the spice curcumin (16 times more active than Hydroquinone) and OxyResvenox®, a derivative of the natural antioxidant resveratrol (32 times as potent as Kojic Acid) are the main ingredients that provide this action. Hydroquinone free. Use on men's beards, back, chest and on women's bikini area, underarms and legs. To prevent the appearance of razor bumps, ingrown hairs, razor burn, use once daily, immediately after hair removal. To address existing problems, use twice daily until skin clears. Spot treat more frequently on recalcitrant areas. The bumps will become less noticeable and less painful very quickly (for some, within 24 hours). The brightening of the dark spots and areas takes place slowly, over a period of several weeks. Unlike our competitors', our product does not sting upon application. This really helps when applying it to recently shaved, waxed or treated skin. It is also non-greasy and non drying. Leaves the skin moisturized. Skin Brightening: with 3 potent skin brightening actives to even out the skin tone, correcting the dark spots. It is a combination of Chromabright®- SabiWhite®, and OxyResvenox®, all patented ingredients. Chromabright ® is a novel skin brightener that has been tested for efficacy and safety with satisfactory results. The product presents no side effects with good efficacy in vitro and in vivo. The combination is synergistic. Hydroquinone free. Contains a small amount of Lavender essential oil, a subtle natural fragrance suitable for both MEN and WOMEN. Lavender oil is recognized as having a skin soothing effect as well as in aromatherapy for its mood calming action. BUMP & BLEMISH® is available in 2 Oz (60 ml) and 4 Oz (120 ml) bottle with ROLL-ON caps or DISC-TOP caps. The 2 Oz bottle provides 3-4 months of twice daily facial applications, the 4 Oz bottle 6-8 months of treatments. In addition, it is available in a 0.4 Oz (12 ml) ROLL-ON bottle, ideal for travel and spot treatment. Are YOU ready to get smooth, clear bikini area skin?